FILE - President Donald Trump speaks in the Rose Garden of the White House, Jan 25, 2019. U.S. President Donald Trump took to Twitter Wednesday, appearing to reignite his long-standing feud with the country’s intelligence agencies by belittling their assessments on Islamic State, North Korea and Iran. FILE - Director of National Intelligence Daniel Coats testifies before the Senate Intelligence Committee on Capitol Hill in Washington, Jan. 29, 2019. “ISIS is intent on resurging and still commands thousands of fighters in Iraq and Syria,” Director of National Intelligence Dan Coats told lawmakers Tuesday, while acknowledging the terror group’s self-declared caliphate had been reduced to a few small villages in Syria, which would likely be liberated in a matter of weeks. On North Korea, Coats and CIA Director Gina Haspel reiterated long-standing concerns that North Korean leader Kim Jong Un, despite being willing to talk with the United States, is not truly ready to give up its nuclear ambitions. 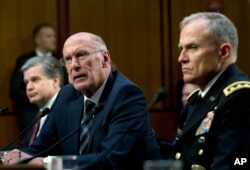 “Its leaders ultimately view nuclear weapons as critical to regime survival,” Coats said of Pyongyang. 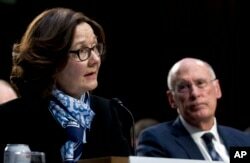 “The regime is committed to developing a long-range nuclear-armed missile that would pose a direct threat to the United States,” Haspel added. As for Iran, the differences between the intelligence agencies and the president appeared to be less glaring. The intelligence officials told lawmakers that the 2015 nuclear deal between world powers and Tehran is working, at least for now, even though Trump withdrew from the deal while re-imposing sanctions. But they agreed with Trump regarding the larger threat. “These actions underscore our concerns for a long-term trajectory of Iranian influence in the region and the risk of conflict escalation,” he added, noting Iranian-backed militants would continue to threaten U.S. forces in Iraq and elsewhere. The CIA, Defense Intelligence Agency and the National Security Agency declined comment when asked about the president’s tweets Wednesday. But the public critiques drew a quick response from some U.S. lawmakers and former intelligence officials. Senate Democratic Leader Chuck Schumer released a letter he wrote to Coats saying he “cannot allow the President’s ill-advised and unwarranted comments” to stand, and that Coats, Haspel and FBI Director Christopher Wray should insist on meeting with Trump to “educate him about the facts and raw intelligence” behind the threat assessment. Yet other former officials described the commotion over the president's tweets as overblown. "This is not that big a thing," said Steve Bucci, a visiting fellow at the Heritage Foundation who previously served as an assistant to former U.S. Defense Secretary Donald Rumsfeld. "Frankly, I see both sides kind of doing what they get paid to do," he told VOA. "The intel community is supposed to be the factual analyzers and the president picks the policies he wants to follow. "They clearly have failed to convince him that their position is correct. And now everybody is going nuts because he's not treating what the intelligence community says as holy writ," Bucci said. Bucci also said it would be a mistake to view Trump's tweets as an indictment of his intel chiefs as opposed to messages meant for Iran and North Korea. "He's trying to move both countries in directions that are beneficial to U.S. interests," he said. "He's not shutting down the intel community." But Pfeiffer cautioned that even if Trump’s responses are merely about politics, it could still take a toll.